Suitable for highly productive workgroups, the Canon i-SENSYS LBP6670dn printer features a duplexer and network connectivity in a compact and lightweight mono laser printer. It is an environment-friendly machine with ample memory and a better engine for speed, along with an intuitive control panel for ease of use, but the inability to print in colour may limit its usefulness among creative users and home offices. 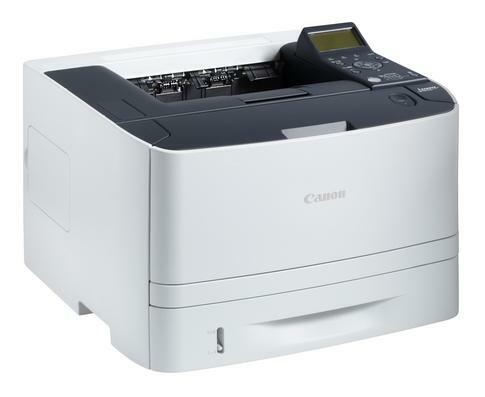 Boxy yet sleek, the Canon i-SENSYS LBP6670dn laser printer impresses with an understated frame that weighs approximately 12.4Kg and measures 400mm wide, 289mm tall, and 376mm deep. There is a 5-line display screen that juts out on top, adjacent to the panel with 10 operation keys and 8 LED indicators. The entire device runs on 512MB of memory, and the built-in interfaces include Ethernet and USB 2.0. The Canon i-SENSYS LBP-6670dn is compact, environment-friendly, and can easily be integrated into a small network of computers via gigabit Ethernet. The LBP6670dn can produce up to 33ppm, with the first page ready in about 6 seconds. Text documents look sharp at 1200x1200dpi, while colour graphics are accurately reproduced in monochrome. The Canon LBP6670dn mono laser printer is easy to operate, speedy, and notable for its time-saving options like the all-in-one toner cartridge and the auto duplexer. The LBP6670dn can only handle monochrome prints. Quiet surroundings might be interrupted by the noise being emitted by the i-SENSYS LBP6670dn while in operation. The small display makes it difficult to view the printer's status under poor lighting conditions. Additional accessories for the Canon i-SENSYS LBP 6670dn including the barcode printing kit needs to be purchased separately.